Marley Dias is an 11-year-old New Jersey resident who’s spent more time giving back to her community in her brief time on this planet than most of us will spend in a lifetime. She’s received a grant from Disney, traveled to Ghana to help feed orphans, and now—in her latest act of altruism—she’s rounding up children’s books that feature black female leads so that she and her peers have more fictional characters to look up to. The project, titled #1000BlackGirlBooks, started when Marley complained to her mother about reading too many books about white male protagonists in school. Marley is looking to collect 1000 books featuring black female protagonists by February 1. She is nearly halfway to her goal. Marley, who hopes to one day edit her own magazine and “continue social action” for the rest of her life, will catalog the donated books and transport them to a children’s book drive in Jamaica. She and her mother are also trying to start a small library in Philadelphia. 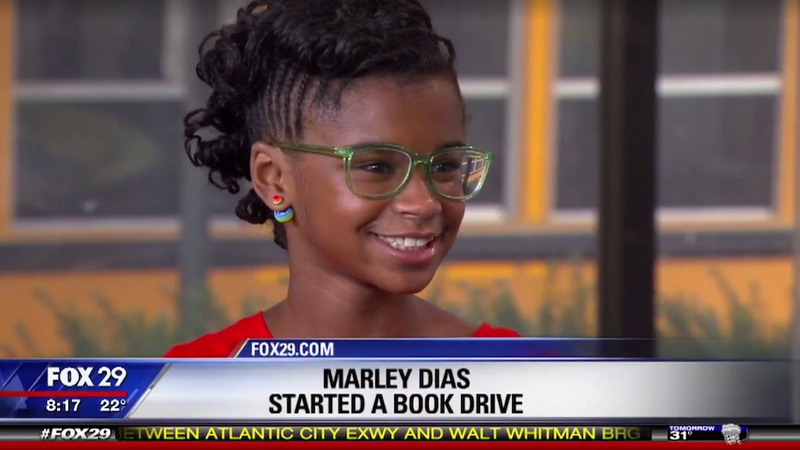 Frustrated by the lack of books about black girls in her school curriculum, Marley Dias launched this campaign to collect 1000 books where black girls are the main characters. The #1000blackgirlbooks project is her BAM social action project for 2016. Books will be donated to Retreat Primary and Junior School and Library in the parish of St. Mary, Jamaica where her mother and GrassROOTS’ President, Dr. Johnson Dias, was raised as a child. Keep up the good work, young shero.